Last night when I laid Jake down in our bed so I could get some sleep he was asleep, but not super deeply. I laid him on his back and as I was moving slightly away from him he reached out and grabbed my arm. I looked over and he was still asleep, but had the biggest smile on his little sweet face. As he settled back to sleep holding my arm I looked over and told Waldo “Either he’s smiling because he’s all ‘I got you, you can’t get away from me’ or because he’s content having a hold of me”. Either way it’s adorable and he’s just so sweet. I can’t believe that Jake’s been here for 4 months already and at the same time it feels like he’s always been here. He’s getting so big (for him) and doing all the really cool baby-growing-up-things; he’s holding his head up really well, he can roll from his front to his back, he smiles so much and I melt for him each time, he chatters and coos and he’s just the coolest little man. He’s not giggling yet, but with Lil it took a lot to make her laugh so I feel we just haven’t figured out Jake’s thing yet. He likes it when I have my hand holding my breast while we nurse and he’ll either hold my finger or rub my hand. It’s the sweetest thing. Last Friday I took Jake to the doctor for his 4 month well child check up and he’s made it to 10 lbs finally. In 4 months he’s gained 4 pounds. He’s in the .2%tile just like his sister. 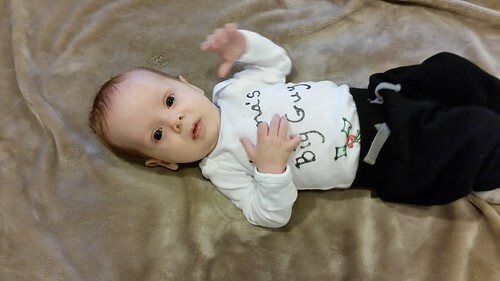 He’s taller than Lil was at this age, he’s 24 inches and because of this he can’t wear his newborn sized pants unless I want him to look like he’s wearing capris. Otherwise he can wear newborn onesies. We are breastfeeding and that is going really well, but just like with Lil the doctor wants Jake to gain more weight so we are supplementing formula everyday. It had been 2 ounces a day, but they want me to go up to 4, but I’m not so sure. He’s great (the doctor said so too) and this is just what my kids do. 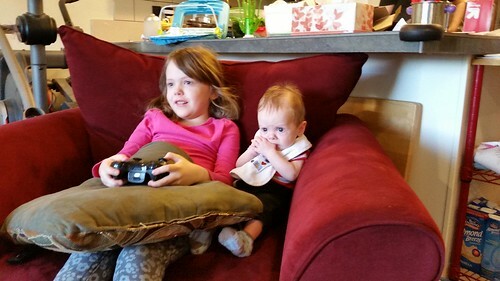 Lily is the best big sister. She is crazy about Jake. She still refuses to call him by name, although she refuses to call most people by name. She calls Jake Brother. Jake’s other nicknames are Pumpkin, Honey Bunny and Professor Pickle Pants or Professor. He’s completed our family and we wouldn’t have it any other way. Edited to add more nicknames that I can’t believe I forgot about when doing the original post. Buddy and Buddy Boy are used all the time. Tonight during tummy time Jake rolled over! He’s 15.5 weeks old. He’s the coolest little man I know. Awe, I think that’s the perfect description for getting married. I love how her mind works. These pictures don’t have anything to do with this conversation except that they are of Lil. I just wanted to add them. Sometimes I look down into Jake’s little face and I swear he’s concentrating so hard. His little brows will be knitted and I can just see the gears working trying to figure something out. In the months and years to come I can’t wait to see if his personality is anything like I imagine him to be. As of right this second I think he’s going to be a calm cuddly little boy how is trying to put all the puzzle pieces into place.